Talk about music software for alternative OSes: the Prophet64 is a new cartridge for the Commodore 64 computer. In case you haven’t yet heard about the project, our friend James Grahame over at Retro Thing has been on top of it for some time, but the big news from him is that the cartridge is officially released and now shipping. This isn’t sheer novelty: for just 39 EUR, one cartridge gives you a whole suite of useful software, from sequencer to synths and grooveboxes. There’s even a modern-style graphical sequencer that can be controlled with a mouse. Fans of vintage trackers are no doubt disappointed here, but the result reminds me a lot of the simplicity I loved about my first DOS sequencer, Cakewalk 4.0. 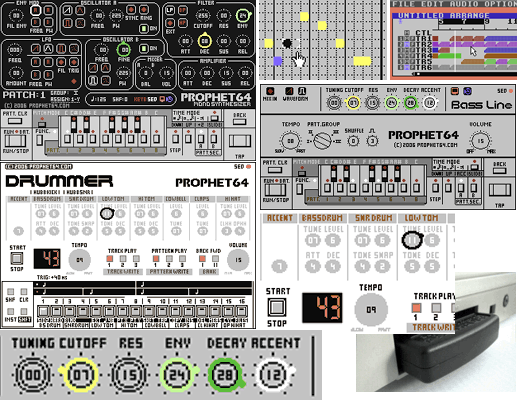 You could use this whole setup as a self-contained studio, with sequencer and synths, but via a third-party MIDI interface in development, you can use the combination as a MIDI-capable C64 groovebox. The Prophet64 Cartridge MIDI interface promises to add additional features, too, like load/save capability, on top of MIDI triggering, song select, and sync. There’s also the promise of PS/2 mouse compatibility, in place of having to get an Atari/Amiga mouse. The developer just got a cart in the mail, so I expect more progress soon. So, let’s add this up: for under $100, you can put together a quite functional music studio, including the computer. I know there are very smart people working on making new computers for the developing world, but for those of us here in the real world, you can save a beautiful machine that would become highly toxic waste and use it in your studio right now. If you’d rather run in an emulator on your PC/Mac, there are also free versions of the software available for download.